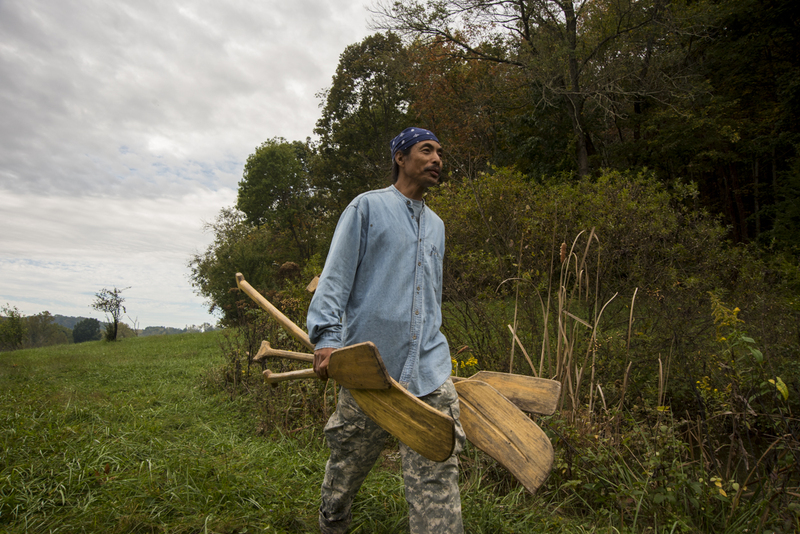 Tracking down Mamerto Tindongan in the rolling landscape of southeast Ohio is no easy feat. With no phone or daily routine, catching Tindongan can be tricky at best. However, as soon as you do locate the 59-year-old Philippine native, his warm, embracing welcome makes the challenge worth it. A good place to start searching for the seemingly illusive man would be his wooded property in Albany. He will likely be found outside and barefoot, moving materials for his next project all while smiling. Mamerto Tindongan poses for a portrait with his hand carved canoe. “He doesn’t want to go around and solicit people to follow him. You know, people just come to him,” said D.j. Fuller, owner of Athens Yoga and Seasons Holistic Arts in Amesville. Tindongan, born and raised in the Philippines in the Ifugao tribe, is a man of many passions. Most people familiar with his talents call him a healer. Above all, he is a friend to many. His home and studio is always open to visitors and those wanting to learn something new. Tindongan said he is often asked by professors how his work is all connected. The lives he’s affected in the Athens area are many. Since moving to Albany, Tindongan has healed as many as 20 people a week and takes walk-ins. Minor’s friendship with Tindongan began six years ago. After an unfortunate diagnosis of Meniere’s disease, a disease of the inner-ear that causes vertigo, years ago, Tindongan would discover through his illness what it was he was supposed to do in life. In 2005, he decided his illness would, in fact, be used to his benefit. It would improve his meditation, teach him discipline to avoid certain triggers of vertigo and be a way to connect to his high-self. Turning a bad situation into a positive is on par with all other aspects of his life. When speaking to Tindongan, his stillness washes over everyone he meets. Even his methods for creating wooden works of art, that being either a canoe, an ancient weapon or even an abstract piece. He approaches the wood with its nature in mind. His skills for hand-carving masterpieces goes back to his deep Ifugao heritage. He first learned the craft of woodcarving when he was just 8 years old. When he was young, Tindongan grew increasingly enchanted by the transformation of rough wood into something beautiful. While Tindongan worked his way through his bachelor's degree in the Philippines and later graduate school in the U.S., woodcarvings were simply a way for some form of income. It became more of a way of life when he met former Ohio University professor David Hostetler in 1994. Renowned for his own woodcarvings and bronze sculptures — Hostetler created the “The American Woman” outside of Alden Library — Hostetler and Tindongan bonded over their similar techniques. “So David saw how I used my tools and said, ‘Oh, I’m going to hire you until I die,’ ” Tindongan said. Tindongan would carve over 400 pieces for Hostetler during their years working together. For Hostetler, Tindongan said he was the young set of muscles that Hostetler no longer had but still needed to execute the sculptors. After Hostetler died in 2005, Tindongan’s passion for woodcarving would shift from being a means of income to a part of a much bigger picture. 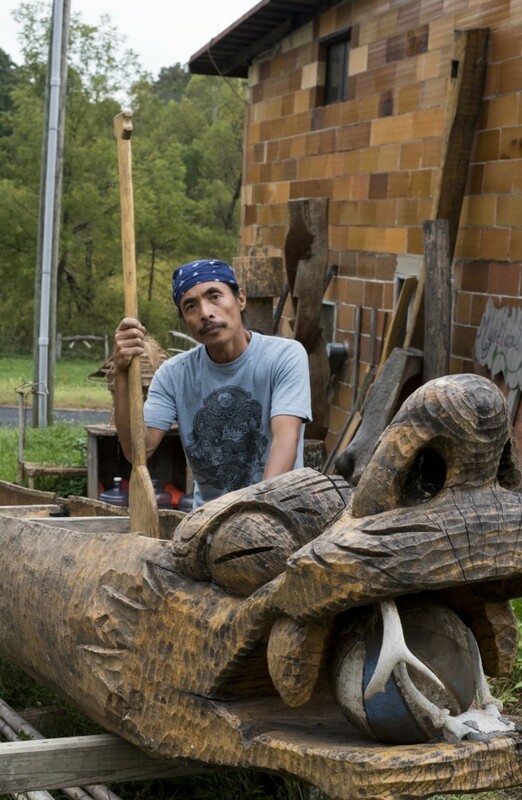 Woodcarving would be just one way Tindongan would help those on the path toward healing. For many, this could be interpreted in many different ways. For Tindongan and those his work touches, it’s simple: The goal is to be free of fear. The philosophy can be seen in all aspects of Tindongan’s lifestyle. His simplistic home, his possessions, the friendships he’s built and the healing work he now does around the community. 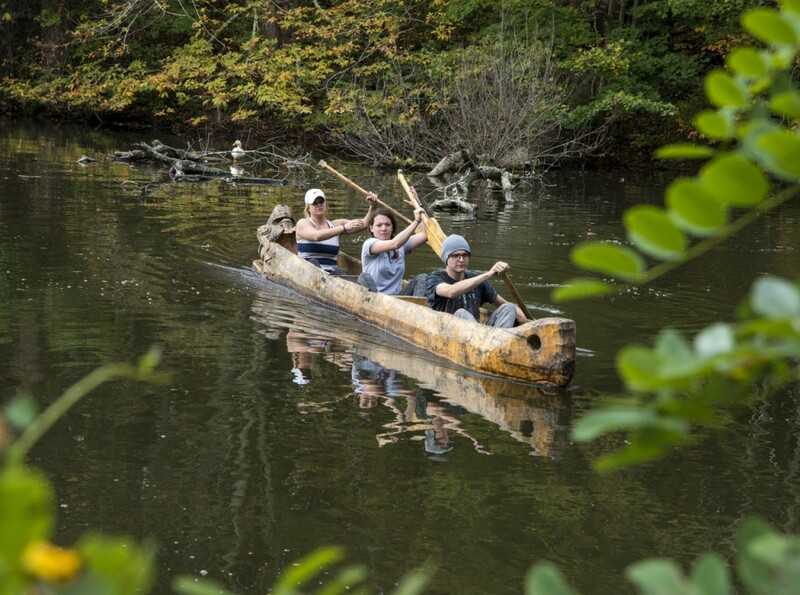 Student’s of Hocking College’s Eco-Tourism class take Tindongan’s canoe out on a pond to try out. The dragon’s head is at the back of the canoe to protect the riders from any dangers. When welcoming groups, students or anyone for that matter, enter his home to facilitate and teach the art of healing using one of his many techniques, a monetary exchange is not always even necessary. “I don’t want money to deter people from getting the help,” Tindongan said. As simplistic and wholesome Tindongan’s life seems, some sort of income is a necessity, however. So, as he plans to host more and more groups to his home for healing sessions, monetary donations are how he plans to move forward.